Hi, friends! 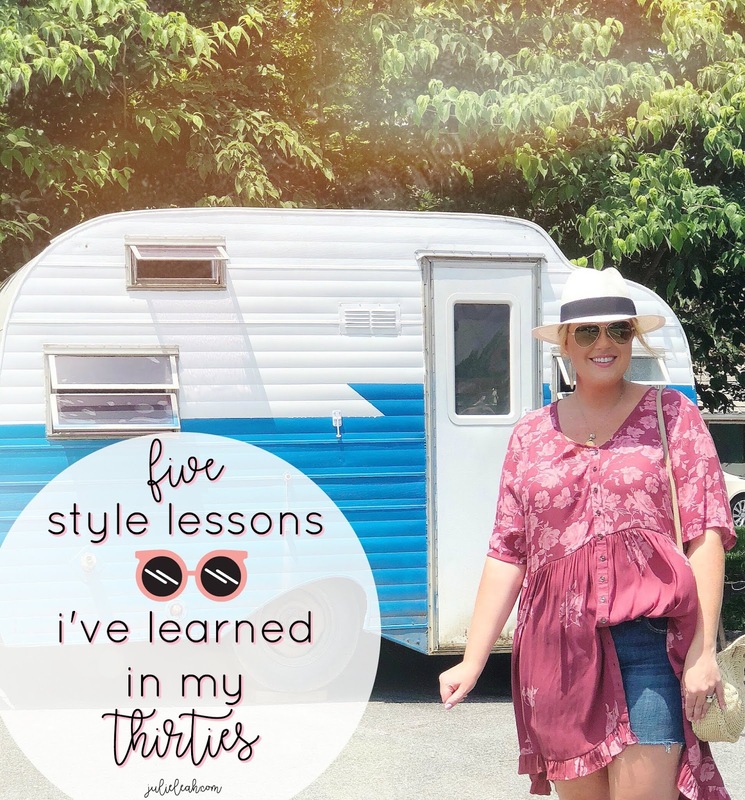 Today I'm sharing some style lessons that I've been living by now that I'm in my thirties. I'll turn 32 in January, and time and time again these little anecdotes ring true when I'm putting together an outfit or shopping for something new. I think dressing in your thirties can sometimes feel tricky by society's standards. Maybe your clothes shouldn't be as fun, maybe you shouldn't embrace cute details, maybe you should just be more aware. I've gotten those messages in lots of different ways, and I'm sure my fellow thirty-somethings can relate. I simply don't have the capacity or patience for someone else's style rules (not sorry). I find myself wearing exactly what I want these days - outfits that wholly reflect my personality. I think that's a philosophy all women should embrace but especially those of us who are often boxed into this "in between" space when it comes to style. I think some of my friends who are older than me would say the same thing about dressing in their forties. If you don't love what you're wearing, it's definitely going to show - so always wear what you love! If that's heels every day - do it. If you're a sneakers and tee shirts girl - wear that! If you want to embrace your love of Disney - don't let anyone stop you. There are so many little things about my style that have made me pause a bit in the past - my love of bag charms, my affinity for hoop earrings, my 90s child love of ankle chains, my natural attraction to pattern mixing. Are these things cool? Are people gonna look at me weird? Since I turned thirty, I never worry about those things. I wear them because I love them, and I hope to inspire others to wear only what they love too! Can I get an amen?! Consistency does not exist among brands when it comes to sizing. So, let me say this again - THE SIZE ON THE TAG DOES NOT MATTER! Try on the sizes until you find the one for your body. And whatever size that may be it's perfect because a size does not define you. You are not reduced to a size on a tag or a size someone thinks you should be. I love that brands seem to be transitioning (slowly) to inclusivity. I give Aerie a lot of credit for this push with their #AerieReal campaign. You are more than a tiny label so don't give it control over your happiness. Just because everyone else is doing it doesn't mean you have to! I promise! There have been so many trends over the years that I went along with because everyone else was. I wish I could have all that money back on stuff I didn't even like. In my thirties, I have completely embraced that I am not obligated to like what a magazine tells me everyone else is liking right now. And you're not obligated either! This has been a hard lesson to learn, but I'm finally only buying pieces that I truly love. That's not to say they're all investment pieces, but they're pieces that I'm not wishy-washy about when I find them. I have a commitment to loving them and wearing them over and over. This was one of my biggest shopping faults to overcome in my thirties. There have been plenty of times that I have walked away from something and still be thinking about it two days later. That's an item that I know I will wear nonstop so I go back and get it. Start the process by going through what you already have. Weed out everything you don't love then start applying that when shopping. Editing my closet is an ongoing process. My tiny house does not allow me a lot of space to work with so this is a constant thing for me!